Prosecution by a public prosecutor includes indictment and request for summary order. Non-prosecution disposition can be grounded on  a lack of necessary conditions (a complaint in the case of offenses prosecutable only upon a complaint, etc.) for prosecution,  failure to constitute an offense (including cases of insanity of the suspect), or  a lack of sufficient evidence to prove criminal conduct, and can also be granted  as a suspension of prosecution, even with sufficient evidence to prosecute, when a public prosecutor deems it unnecessary to prosecute the case due to the character, age, environment of the suspect, degree of the gravity of the offense, and circumstances after the offense. Fig. 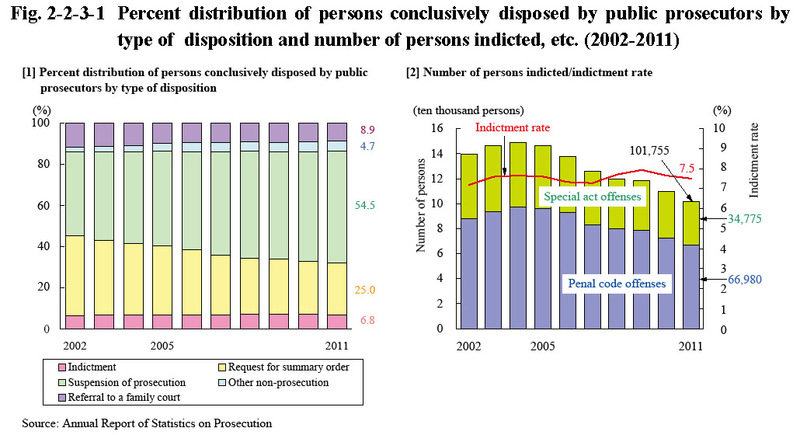 2-2-3-1 shows the percent distribution of persons conclusively disposed by public prosecutors (including juvenile cases) by type of disposition, number of persons indicted, and the indictment rate over the last 10 years. 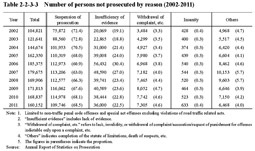 Of 1,487,266 persons conclusively disposed by public prosecutors in 2011 (down 90,103 or 5.7% from the previous year), the number of those indicted was 101,755, that of those for whom a summary order was requested 372,370, that of those granted suspension of prosecution 810,344, that of those not prosecuted for other reasons 69,943, and that of those referred to family courts 132,854. The number of persons indicted continued to increase every year from 1995, but then started to decrease in 2005. In 2011 it decreased by 7,817 (7.1%) from the previous year (See Appendix 2-2). Fig. 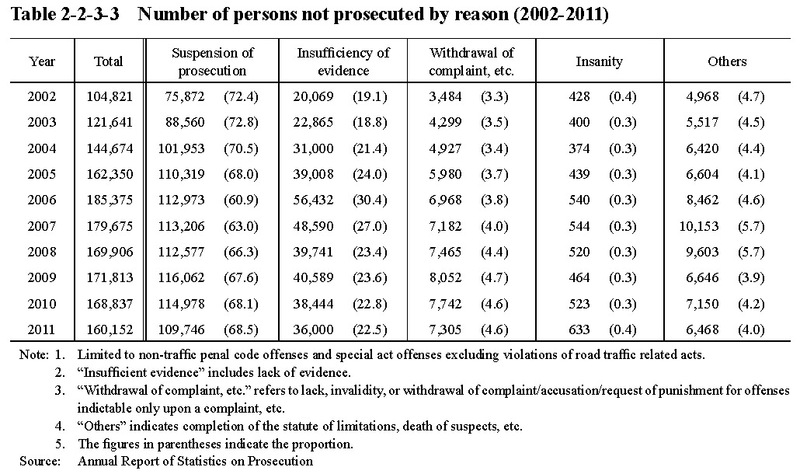 2-2-3-2 shows the number of persons conclusively disposed by public prosecutors that were then prosecuted, granted suspension of prosecution, or not prosecuted for other reasons, and the prosecution rate by type of offense over the last 10 years (See Appendix 2-3). Negligence in vehicle driving causing death or injury, etc. 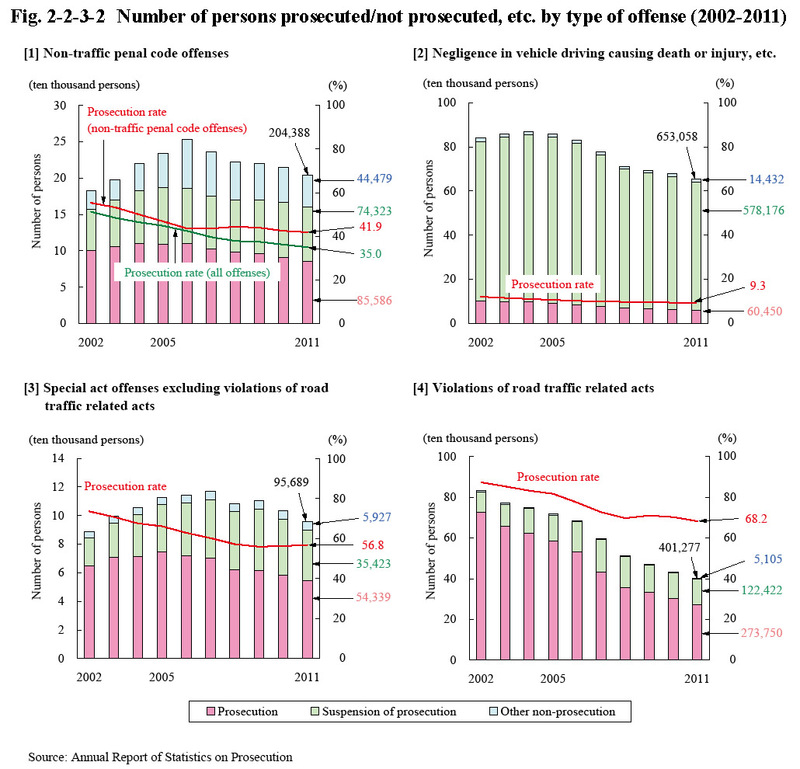 and violations of traffic related acts accounted for the majority of the number of persons disposed, although the number of persons disposed and prosecuted for violations of traffic related acts significantly decreased over the last 10 years. 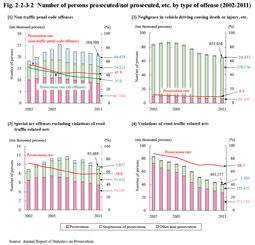 Table 2-2-3-3 shows the number of persons not prosecuted by reason (limited to those disposed for non-traffic penal code offenses and special act offenses excluding violations of road traffic related acts) over the last 10 years. In 2011 the percentage of those suspended prosecution declined by 3.9 points from 2002 whereas the percentage of those not prosecuted due to “lack of evidence/insufficient evidence” rose by 3.3 points.